Slate can be grinded if smooth as to remove any scratches and dull appearances, then an impregnator is applied followed by a colour intensifier to deepen the natural colour of the stone. Riven or rough finish Slate can be chemically cleaned then let dry for few days, before applying an impregnator to prevent water and oil penetration. If desired, a wet finish look can be applied during the slate restoration process. Slate comes in different colours and shapes, after a full slate restoration your slate must be treated with care. At Posh Floors; our qualified stone masons can recommend you the right procedure of maintenance for long lasting slate flooring. We specialise in slate restoration and cleaning. 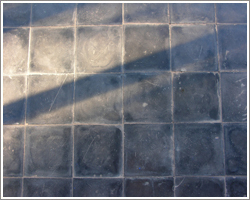 Don’t delay contact us Now on 0845 652 4111 for cleaning slate tiles to revive your Slate Floor.